9 nights in comfortable hotels and some small guest houses. Warm welcome and great local cuisine. 9 nights' half-board accommodation. Full walking notes and 1:25,000 maps, transport of luggage between guest houses. Discover an amazing variety of landscapes in the southern Massif Central as you head south through the Cevennes, passing must-see sites such as the Tarn Gorge and the Navacelles Cirque and finishing at the pretty village of Saint-Guilhem-le-Desert. With wild, rugged mountains and picturesque historic villages this independent walking holiday is ideal for those walkers looking to get off the beaten track. The Saint Guilhem path was originally a drovers path for farmers moving their animals to the markets in the south. 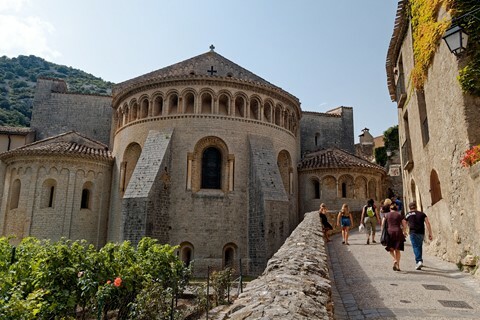 But the trail later became popular as a pilgrimage route to the resting place of William of Orange - White Knight of Charlemagne, located in the historic church in Saint-Guilhem-le-Desert. Your walking holiday starts in Canourgue in the heart of the southern Massif Central and heads south. Over the course of your 8-day walk you'll discover a range of landscape and experiences including the limestone plateaux used for grazing which resemble the steppes of Asia. These are dissected by spectacular gorges such as the Jonte and the Tarn gorges which offer breathtaking views. Further south lies the Cevennes National Park with its wild and rugged mountains where you have the opportunity to climb to the summit of Mont Aigoual, from where on a clear day it is possible to see both the Alps and the Pyrenees. Further south still and the vegetation begins to change as you now progress on the southern slopes of the Massif Central. Within the next gorge is the amazing Cirque de Navacelles, a spectacular bend in the gorge carved by the river far below. 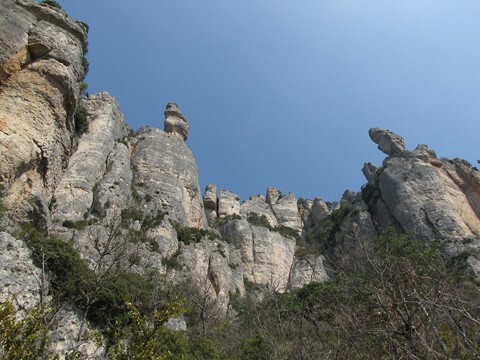 You'll also get to see Cirque de Seranne, another beautiful U-shaped valley carved into the rocks before reaching the historic village of Saint-Guilhem-le-Desert on the edge of Provence. This pilrimage trail is perfect for walkers looking for a quieter experience than those experienced on the Saint James' trail, as despite the wonderful landscapes on route, it is little known outside of France. 8 days independent walking moving between guest houses. The days average 6 hours walking with an average of 20km and +650m per day. Maximum altitude gain in one day is +910m (without option of going to summit of Mont Aigoual) and maximum distance is 25km. The Cevennes is rugged and mountainous - the paths are generally good, although some sections can be rocky and quite steep. You should be reasonably fit, be able to navigate in the mountains, be comfortable walking on paths in mountainous areas and have a good head for heights. Welcome at your first hotel in Canourgue. Your first day is a long one. Climb onto the Causse de Sauveterre, the first of a series of limestone plateaux. Your walking trail alternates between small hamlets, pasture and forest until you reach Champerboux. From there you'll descend into the spectacular Tarn gorge to reach the medieval village of Sainte Enimie. min 25km (distance dependent on location of first hotel), 7hrs 30, +645m, -730m. Cross the Tarn gorge and climb onto the Mejean Causse. This is perhaps the most impressive of the dry plateaux with wild open spaces of grassland with only the odd farmstead until you reach your accommodation in Nivoliers. 15km, 5 hrs 30, +675 m, -190m. Continue your way across the Mejean plateau where you could be forgiven for thinking you were in the steppes of the far east. It is a bleak but magical landscape with pretty hamlets, pre-historic stone monuments and mile upon mile of dry grassland littered with rocky outcrops. 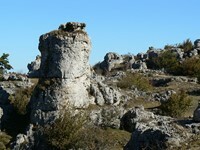 You'll pass by Nimes-le-Vieux, a site composed of chaotic aligned boulders and rocks. Afterwards, descend into the Jonte gorge to the village of Meyrueis, sandwiched between the slopes of the gorge. 15km, 5hrs 30 +280m, - 520m. Climb towards Mont-Aigoual through forested slopes following a ridge leading to Prat Peyrot. If the weather is good it is possible to extend your walk by climbing there and back to the summit of Mont Aigoual. Exceptional views from the summit on a clear day. Descend to the upland village of L'Esperou at over 1000m in altitude. 17-23km, 6-8hrs, +900m or +1075m, -395m or -560m. A series of climbs and descents in pine and beech forests on the southern flank of Mont Aigoual via numerous passes. Descend to Le Vigan in the valley where orchards prosper in the warmer climate. 18km, 6hrs, +275m, -1250m. Pass by the medieval bridge at Le Vigan and then the pretty hamlets of Aveze and Montdardier before crossing the Blandas Causse or plateau. Cross the pleateau to reach the hamlet of Blandas before a dramatic descent into the Navacelles Cirque. Descend into the Vis gorge. The cirque is a dry valley or meander of the river which has since moved. Night in the hamlet of Navacelles at the foot of the cirque. 24km, 7hrs, +690m, -600m. Your walking trail follows the 300m deep gorge on its slopes at mid-height until you reach another cirque: Cirque de San Peyle. Here, climb onto the Larzac plateau. Pass through the hamlet of Saint-Maurice-de-Navacelles before heading east along the top of the gorge. Then descend again to reach your accommodation. 16km, 5hrs 30, +480m, -550m. Climb out of the gorge and then climb the Natges Valley and reach Cirque de la Seranne. Option to climb to the summit of Peyre Martin to have great views over the cirque. The landscape becomes more rugged as you cross the last slopes of the Massif Central on rosemary covered slopes. 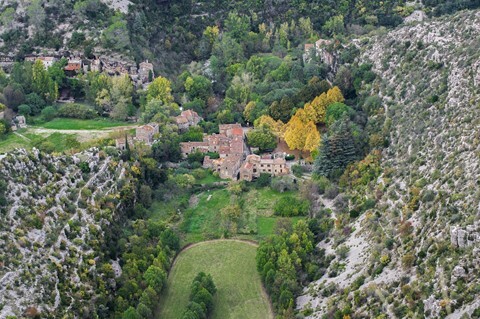 Pass by the Belle Grace Hermitage and the Cirque de l'Infernet before a final descent to the historic village of Saint-Guilhem-le-Desert. 21km, 6hrs 30, +700m, -895m. 9 nights in comfortable small guest houses & hotels. Warm welcome and great local cuisine. They vary in their style, character and quality, ranging from rustic auberges to 3 star hotels. They all have comfortable en-suite rooms. Some have swimming pools and outside patios with great views. Make your own way to Canourgue in France. Train to Banassac-La-Canourgue station which is on the line Paris - Clermont-Ferrand - Beziers. To get to Paris from UK: Eurostar trains from London St Pancras to Paris. Station of Banassac-La-Canourgue is outside village by a couple of kilometres. Transfers to accommodation can be booked via us. 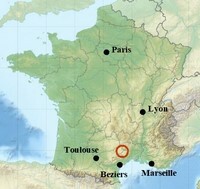 The nearest airport with international flights is Beziers. Flights from UK airports with RyanAir and after transfer to city, train as above. At the end of holiday, take regular bus service from Saint-Guilhem-le-Desert to Montpellier. Line 308 and 381. First bus is at 12.45. Cost is 1,50 euros. Main line train line from Montpellier to major cities. Flights to Beziers from UK airports with Ryan Air and train line as above.